A fat person and running seems a combination which is difficult for most people to comprehend. Many look at me with disbelief when I tell them that I have started to run. Some have even passed snide remarks asking me if I even knew what running was and whether new potholes have appeared on the roads where I run. Well, I being me.. left the haters gaping, when I started participating in marathons and running 5K distances. That was the best retort I could give them. I started training late last year and have written about it in this post. Now, every time I lace up those shoes, a thrill goes through me and I am waiting for my shoes to eat up the kilometers. I don't run to lose weight, I run for fun and what fun I am having. 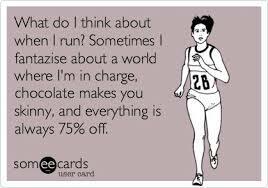 Every runner will know that a myriad of thoughts go through their minds while running long distances. I have my fair share of weird thoughts sometimes bordering on the bizarre. Here's what I think, not decidedly in any particular order. Why didn't I start doing this when I was younger?. Duh!! "My hooves are burning, baby! They are burning! Look at this. I got to tip-toe! I got to tip-toe!" Whatcha looking at mister.. Never seen a fat girl run? Now you've seen it.. You can close your mouth now. Yeah.. You women.. Stop scanning me from head to toe.. Come and run with me. Coming through.. Make way people..
Stop walking like it's a park. Dang! Stepped in poo.. Hope it's just dog poo and not something else..
Every where I go the stink will follow. Cmon! don't be a sissy, just keep moving those legs. Hope I don't look as if I am having a stroke..
Yippee another runner..am going to smile...definitely smile.. He didn't..I must look like a complete moron. Hey there puppy..you are cute..wish I could stop and pet you..
Hurrah! I see another female runner...so gonna wave..and you deserve my brightest smile. Some women really don't know what bra to wear..
Sheesh..are they supposed to look like that? I can't breathe..I can't breathe..
You need to stop f*****g with me..
Why do roads have these climbs? Why? Why? Why can't they make them smooth and straight..
Well I am over that climb..this feels easy..just keep breathing..just keep breathing..
Halfway done..now just half remains..this is easy peasy. You in that car..eat my dust. I am sweating like a pig..what a weird phrase? Should I Google that when I go home? Sweat is good..skin will glow..let it flow..
Why do sports companies make clothes so small? I can never find my size..it's depressing.. Hot guy is back...well do I care..I am on a roll here.. I hope my maid will come today..not in a mood to do the dishes. 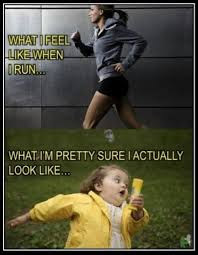 Why did I ever start running? I feel I have been running for an eternity..I think I should just give up..
That happens after eating too much pizza while watching reruns of "Friends". Hey look a new restaurant..I need to check it out.. I deserve it..I am working out so hard. Why people keep staring at me when I run? Do I care what they think? Hell no...tomorrow I will wear my shortest shorts and run..take that. Why do people think running is fun? Why did you think it was fun? Why do other runner's make it look so easy? I am going to die right here. Who will take my body? After all I didn't die..need to "live in the moment". I think I should have been done by now. Runkeeper woman..why did you stop talking? oh! I have another Kilometer to go..
Not too tough now..you are in rhythm. Hey look that runner waved at me..
That makes me cool too..yippee!! Maybe I should just sign up for a run or two.. I am definitely doing that. This post has been inspired by this post.